Smells nice Multipurpose cable clips organizer - Use for power cords charging cables USB cords cell phone chargers audio cables headphones etc. Applications: power cords charging cables USB cords cell phone chargers audio cables headphones etc. 9 Free Glue self-adhesive pads adhere to any surface: desks tables walls filing cabinets furniture etc. Disassembly is easy and without any residues. 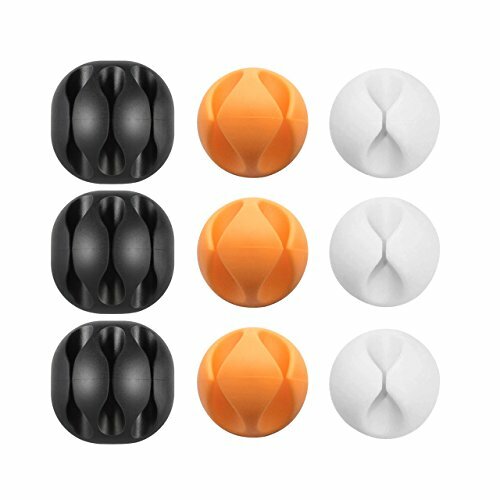 Package includes - 3 type of color cord clip 9 single channel cord clip.Keep your desk clean and organized.Tired of all those cables around your deskTVcomputer or cell phone and Electronic cord management system - Good solution to keeping your desktops clean and organized.